The Flexible Mullen Fulmer cheekpiece, will have the same effect as the traditional Eggbutt. As a result, it will prevent pinching on the sides of the mouth. 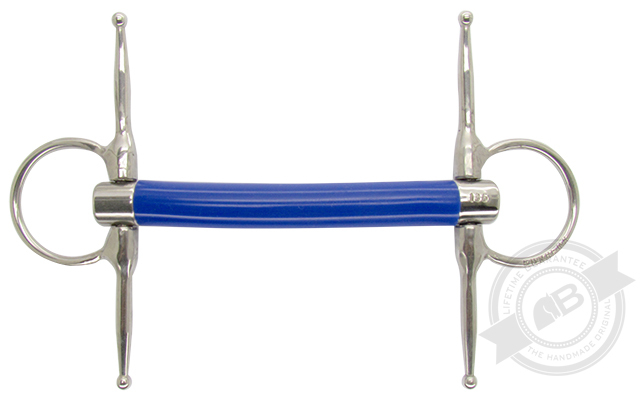 Consequently, the extended pins above and below the bit, firstly prevent the bit being pulled through the mouth and secondly have the effect of guiding the horses head. Furthermore this is a great for schooling and training purposes. Bombers Flexible Mullen mouthpiece is made from an internal stainless steel chain covered with a non-toxic, UV resistant PVC tube. This bit offers exceptionally soft and evenly distributed pressure over the tongue and bars.